The State Board of Elections and Ethics Enforcement cannot certify or print any election ballots until after a Wake County judge hears full arguments over the General Assembly’s decision to change judicial election rules after candidate filing. Chris Anglin and Rebecca Edwards both filed separate lawsuits over Senate Bill 3, which retroactively requires judicial candidates to be affiliated with the party listed on their voter registration for at least 90 days before filing for a race. 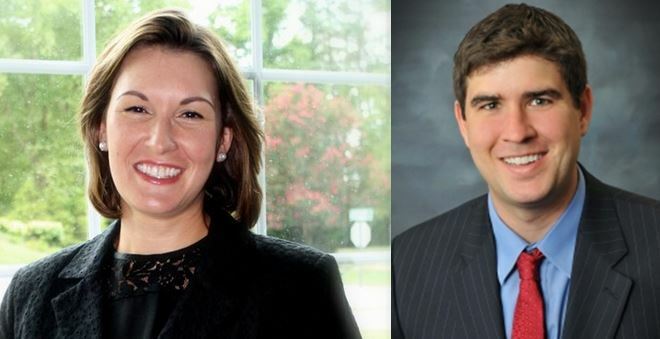 Anglin, a state Supreme Court candidate, changed his Democratic affiliation to Republican on June 7 and Edwards, a Wake County District Court candidate, changed her Republican affiliation to Democratic on May 30. They both challenged SB3 only as it applied to their candidacy and said it violated several of their rights, including their First Amendment association rights and their equal protection rights. Judge Rebecca Holt presided over Monday’s hearing over temporary restraining orders. Holt took what appeared on its face to be a more measured approach, though a top GOP lawmaker later called her decision “disappointing” and indicated an appeal was imminent. She enjoined the State Board from printing the ballots — which they would have done Wednesday — in order to have a full preliminary injunction hearing next Monday. She stayed the part of SB3 that would have required Anglin and Edwards to make a decision about moving forward in their respective races without party affiliation or withdraw altogether. Holt said her decision gives both sides — lawmakers and the candidates — an opportunity to fully brief the court on the issues. Any documents they plan to file must be submitted by 5 p.m. Friday. An attorney for Edwards, Narendra Ghosh, said after the hearing they were “pleased with the outcome” and looked forward to Monday’s hearing. Ghosh is a board member of the North Carolina Justice Center, the parent organization to NC Policy Watch. Anglin indicated in a news release he too approved of Holt’s decision, though he added he wasn’t surprised by it. Rep. David Lewis (R-Harnett) tweeted his disapproval after the hearing. An attorney with the North Carolina Department of Justice told Holt that the State Board needed 30 days to print and certify ballots, and that absentee forms were scheduled to go out Sept. 7 — which means Wednesday is the 30-day deadline. Anglin’s attorney, John Burns, who is also a Wake County Commissioner, said, however, during the hearing that the deadline was not hard and fast. Burns argued that the legislature could not “reach back in time” and change election rules without violating his client’s rights. He also argued that the bill was aimed specifically at Anglin, not Edwards. Martin Warf, the attorney representing lawmakers, contested the “vested right” argument several times throughout the hearing. He said the law wasn’t totally retrospective in that the ballots were not yet set. He added that candidates did not have a right to control information on the ballot and cited several court cases as precedent. “That is entirely the province of the General Assembly in North Carolina or a legislature in the various states,” Warf said. Ken Soo, another attorney for Edwards, argued that SB3 absolutely was retroactive because there was no way for his client to correct her current non-compliant party affiliation status “short of going back in time” and no way for her to appeal except to the courts. He said everyone else in the District Court race Edwards was a candidate for would have some party label beside their name on the ballot, but she would have nothing. “This denies her speech and association rights and does so without due process, and it all but ends her prospect for election,” Soo said. He quoted from an affidavit they provided the court from Gary Bartlett, who was the Executive Director of the state Board of Elections for 20 years. Holt scheduled a preliminary injunction hearing in the cases for 10 a.m. Monday at the Wake County Courthouse.